Dr. Todd F. Bischof is a native of Medina, Ohio. In 1981, Dr. Bischof enrolled at the University of Akron on a football scholarship, lettering his first two years. He gave up the final two years of eligibility to concentrate on his studies, earning his undergraduate degree and gaining early acceptance into Optometry school in 1984. 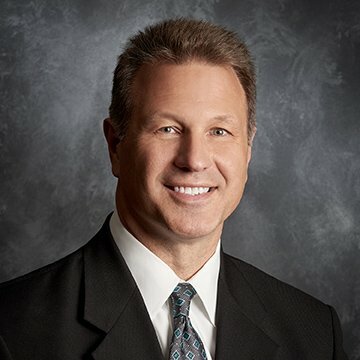 In 1988, Dr. Bischof received his Bachelor of Science degree and Doctorate of Optometry degree from the Illinois College of Optometry in Chicago, Illinois. During his time in Chicago, he completed medical externships at the Chicago Institute of the Blind and the Great Lakes Naval Hospital. Dr. Bischof is an active member in the American and Ohio Optometric Societies and is certified and licensed by the International and Ohio Boards of Optometric Examiners in the treatment and management of ocular disease. Following graduation, Dr. Bischof moved to Cuyahoga Falls, Ohio where he went into private practice with Dr. Thomas Shaheen. Their entrepreneurship, dedication and success was featured in a national optometric magazine. In 1997, Dr. Bischof and Dr. Shaheen joined their practice with Dr. Charles Davis forming the Davis Eye Center. With this new facility the doctors specialize in comprehensive eye care while providing greater convenience and continuity of care to their patients. In this day and age of managed care, Dr. Bischof strives to maintain a caring, friendly, family atmosphere. He enjoys and takes pride in taking the time to help and treat his patients appropriately with a sincere, caring attitude. Being an avid exercise and sports enthusiast, Dr. Bischof enjoys jogging, weightlifting, photography, boating and fishing. However, his most cherished moments are when he and his wife, Annette, are watching their four boys, Tyler, Nathan, Brandon and Garrett, play their various high school and college sports.